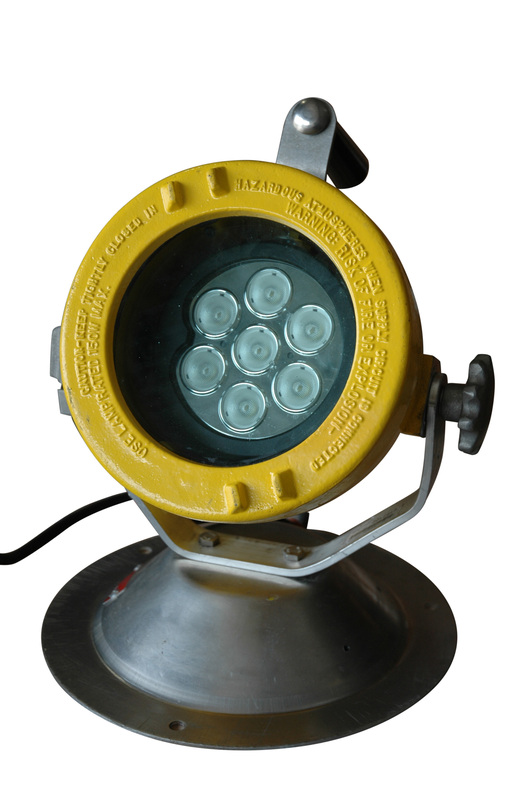 The Magnalight EPL-BS-70LED-100X12 Pedestal Mounted Explosion Proof LED Light from Larson Electronics’ is a low voltage lighting solution which uses advanced LED technology and an industrial grade design to provide operators in hazardous locations with excellent illumination and low voltage operation. This pedestal mounted LED light produces 6,020 lumens and is equipped with an inline transformer that steps down standard 120V-277V AC current to 12 VDC for applications requiring low voltage operation. The EPL-BS-70LED-100X12 explosion proof LED light produces 6,020 lumens of high quality illumination using seven 10 watt Cree LEDs and advanced PWM LED driver technology. Designed with durability in mind, this unit features high output LEDs fitted within a housing constructed of copper free aluminum with a 3/4" thermal shock and impact resistant tempered glass lens. A thermoset powder coated finish and threaded joints lubricated with non-drying lubricant provide added durability and reliable explosion proof protection. This unit is designed for portability and rugged use and is highly resistant to damage from impacts and vibration. A circular pedestal style mounting base constructed of copper free aluminum allows easy and stable placement of this portable LED light on any flat surface. Magnalight has fitted this portable explosion proof light with an inline transformer that steps down standard 110-277 VAC current to 12 VDC, making this light an ideal lighting solution for hazardous locations where low voltage operation is required or preferred. This light and transformer package is waterproof and suitable for wet or marine locations, and includes 100 feet of explosion proof cord to provide ample length for lamp placement in the workspace. The LED lamp assembly in this explosion proof light is controlled by advanced LED drivers which incorporate pulse width modulation (PWM) technology to provide active LED heat management for maximum LED output and operational life. These PWM controllers help these LEDs provide 50,000 hours of operation while retaining 70% of their output at the far end of their operational life. The EPL-BS-70LED-100X12 explosion proof LED light provides higher output and better light quality than comparable halogen lamp equipped lights, yet runs much cooler and uses far less power, making it a safer and more efficient lighting solution for hazardous locations. “The EPL-BS-70LED-100X12 was designed to meet the market needs for high powered, low voltage LED explosion proof lights,” said Rob Bresnahan with Larson Electronics’ Magnalight.com. 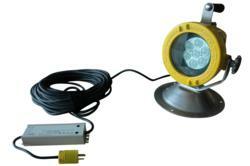 “This portable LED explosion proof light is lightweight and durable. The attached transformer enables operators to power this 24/12 volt, Class 1 and Class 2 Division 1 LED light from a 120/277 VAC 50/60Hz power source. Larson Electronics’ Magnalight.com carries an extensive inventory of explosion proof LED lights, LED blasting lights, LED spotlights and 12/24 volt LED lights. Visit Magnalight.com to view their entire inventory of LED lighting solutions or contact them for more information by calling 1-800-369-6671 or 1-214-616-6180 for international inquiries.